If you want to find out what some common terms are as it relates to chainsaws then you’ve come to the right place as these are terms you’ll frequently hear when people talk about chainsaws. Our chainsaw glossary will continue to grow over time. Anti-Vibration System: A system containing springs and bushings which prevents or reduces vibration to the chainsaw operator. 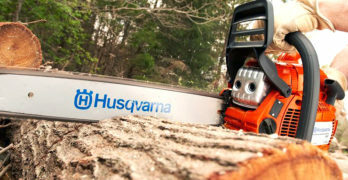 A lot of modern saws have electrically heated handles which help prevent hand-arm vibration syndrome (HAVS) by encouraging circulation to the fingers. Bucking: is the process of cutting a felled tree into logs, typically for a fireplace or stove. Bumper Spikes: Metal spikes which act as a pivot between the engine body and guide bar. Chain Brake: is operated by the top-hand guard being pushed forward to engage the brake, and pulled back to disengage. This spring-loaded action enables powerful braking under emergency conditions and can stop a chain in a fraction of a second. Chain Catcher: is a plastic or metal guard designed to prevent a broken or derailed saw chain from hitting the operator. Chain Pitch: is the distance between the chain’s drive links. The pitch measurement of the chain tells a user the overall size of the saw chain. A larger pitch indicates a heavier and bigger chain. It is calculated by measuring the distance between any three consecutive drive links and then dividing by two. Example: 3/4″ divided by 2 = 3/8″. Chain Tensioning Device: During use, a chainsaw chain loses some of its tension and will need tightening. The tension of the chain should be checked every time you use the chainsaw; if the chain’s too slack it could come off during use. The chain tensioning device will either be a thumb-wheel lever you can grip and turn or a screw that you tighten with a screwdriver. Centrifugal Clutch: Is the component or part between the engine and the chain. When the engine is idle the clutch is disengaged from the engine and engaged when the saw is cutting. Chain Tensioning Device: Component used to adjust the tension of the chainsaw guide bar. Chaps: protects only the front of the legs and worn over conventional work clothes. Chock: wedge or block implemented to secure a log and prevent it from moving. Choke: mechanism that controls the air to fuel ratio supplied to the engine. Depth Gauge: each chain tooth has a depth gauge which rides ahead of the tooth and limits the depth of cut. Depth gauges are an essential safety feature. A depth gauge that’s too high will cause very slow cutting, if too low the chain will become more prone to kickback. Engine Displacement: represents the engine’s size and power, indicating the volume of an engine’s cylinders. The displacement figure represents the maximum amount of air displaced by the pistons in all of an engine’s cylinders and is expressed in liters, cubic centimeters or cubic inches. Felling: is the process of downing individual trees. The person doing the cutting is called the feller. Front Hand Guard: primarily controls the chain brake. The brake is engaged when the hand guard is pushed forward and becomes disengaged when pulled back. This spring-loaded component allows powerful braking under emergency conditions and can stop a chain at full power in a fraction of a second. Fuel Stabilizer: Fuel degrades over time and fuel stabilizers prevent the degradation. Grubbing: revolves around the removal of trees, shrubs, stumps and garbage from a transportation corridor, cut lines or the footprint of a structure. 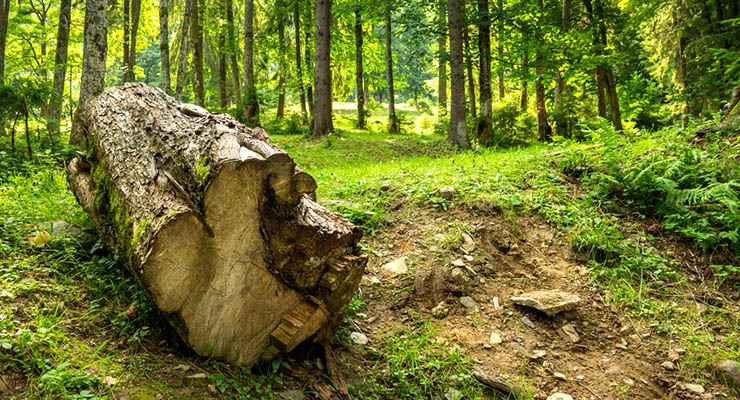 In the context of chainsaws, refers to digging around a tree stump with the intention of removing it from the ground. Hand-Arm Vibration Syndrome (HAVS): is a medical condition caused by continuous exposure to vibrating handheld machinery. Inertia Brake: A safety mechanism that immediately stops the chain when kickback occurs based on the rotation motion of the chainsaw. Kerf: The groove made by a cutting tool, like a chainsaw or an axe. Kevlar: is an extremely strong material (a plastic) made by DuPont™. Kickback: occurs when the chain near the tip of the chainsaw’s guide bar either catches on wood without cutting through it, or when the wood closes in and pinches the chain in the cut. Either of these incidents will force the chainsaw backwards and/or upwards in an arc motion towards the operator. Lithium-Ion: are high density batteries with electrodes made from lithium and carbon. Manual Brake: a brake that stops the chain in a fraction of a second, triggered by pushing the front hand guard forwards. NiCad (or Nickel-Cadmium): an older form of rechargeable battery with electrodes made from nickel oxide hydroxide and metallic cadmium. Oiler Control: An automatic or manual system used to oil the guide bar and chain. Pinch: When the chainsaw guide bar gets stuck inside a cut. Pole Saw: Essentially a chainsaw (gas, electric or manual) attached to a long pole allowing the user to work comfortably from a distance. Powerhead: The main housing for the chainsaw, encasing the engine and all other components. Pre-Mixed Fuel: A convenient way to buy fuel for your chainsaw which comes pre-mixed with: gas, engine oil and fuel stabilizer. Pruning: The act of trimming a tree, brush or shrub by cutting off branches, twigs or roots. Pull-In: The force that draws the chainsaw operator toward the wood being cut. Push-Back: The force that draws the chainsaw operator away from the wood being cut. Raker: Front area of the cutting chain containing the depth gauge. Rip-Cut: The act of cutting a piece of wood parallel to its grain. Safety Throttle: prevents the chain from being turned on if the trigger is accidentally pushed by an obstruction. The safety throttle is an additional layer of safety and protection. Scabbard: A protective sleeve for the guide bar and chain when the chainsaw is inoperative. A safety device preventing injury while storing or transporting the chainsaw. Scrench: A tool used to adjust your chain tension and also allows you to easily remove your chain or guide bar. Skidder: A heavy vehicle typically used in forestry to pull trees out of the cutting spot to the landing area. Spark Arrestor: A screen situated over the muffler to prevent sparks from getting out. Two-Stroke Engine: An internal-combustion engine used in chainsaws where the intake, power and exhaust happen on the downward stroke of the piston, while compression occurs on the upward stroke. 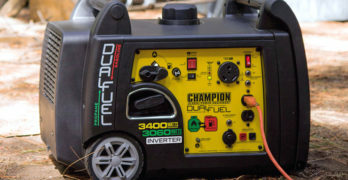 A powerful, light and efficient engine perfectly suited for chainsaws, snowmobiles and lawnmowers. Two-Stroke: Specific oil mixed with gas in order to power and lubricate a two-stroke engine. Undercutting: The process of cutting upwards from the bottom of the log. Wedge: A tapered “wedge-shaped” object placed in a kerf, or cut. Typically utilized to prevent pinching, split wood or aid lean the tree toward the chosen fall direction. Widow Maker: Describes dead or detached branches, or tree top that may fall and cause injury or damage when felling a tree.